The needs of wounds differ as they progress through the healing process, and all wounds benefit from a properly moist environment that supports normal cell function. With just a few different moisture-retentive dressings (MRDs), the clinician can work synergistically with the cells to support microscopically precise debridement and repair for a wide variety of wounds, while providing the patient with a faster, healthier, and more comfortable healing experience. Nonselective: Removal of both healthy and unhealthy tissues. Surgical debridement: Tissue removed by surgeon according to characteristics, such as color, texture, vascular supply, and temperature; selective on a macroscopic level. Mechanical debridement: Physical removal of tissue adhered to a dried-on dressing; nonselective and, thus, the least desirable form of debridement. FIGURE 1. Several days after being hit and pinned under a car, this mixed-breed dog developed an eschar on its left side that ultimately sloughed, leaving a large wound. Surgical intervention was limited due to the client’s financial restrictions. Because this dog was treated before my exposure to moist wound healing practices, healing time was long. The boxed area shows the location of the wound. FIGURE 2. 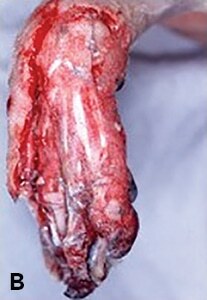 Patient from Figure 1; day 7 after injury: Necrotic tissue and an eschar (asterisk) remain after a large section of skin had sloughed. Microscopically, WBCs are selectively debriding the diseased tissue. 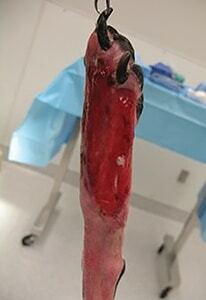 Surgical debridement and lavage were performed after this photograph was taken. FIGURE 3. 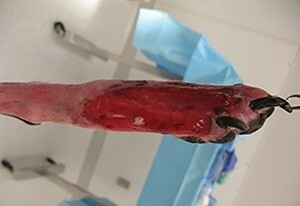 Patient from Figure 1; day 11 after injury: Granulation tissue is moving in from the periphery of the wound, while the central area is still undergoing debridement by WBCs. FIGURE 4. Patient from Figure 1; week 6 after injury: Granulation tissue is filling the wound. A rim of pink epithelial cells is migrating inward across the granulation tissue, building new skin. Contraction has pulled pre-existing skin inward, diminishing the size of the wound. 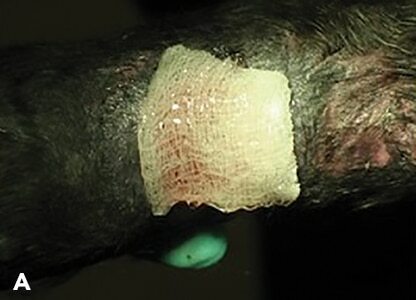 Wound closure is performed after all contaminants and nonviable tissue have been removed, and it can be orchestrated by the animal’s body or clinician. The body typically accomplishes closure over 2 to 4 weeks via the repair (proliferative) phase of wound healing.2 During this phase, skin coverage of the wound is achieved through 2 simultaneous, yet independent, means—epithelialization and contraction. Granulation tissue: As wound bed debridement by WBCs progresses, cells on the periphery of the wound receive signals to move in and fill the cleaned-out defect with granulation tissue. Granulation tissue is built by fibroblasts, which secrete new extracellular matrix molecules (eg, collagen, elastin) and endothelial cells, which build new blood vessels (Figures 2 and 3). Epidermis: Epithelial cells on the skin edge then migrate onto the granulation tissue, which provides the oxygen, moisture, and surface required for epithelial cells to proliferate, cross the wound, and create a new epidermis (Figure 4). Myofibroblasts: Wound contraction occurs when the fibroblasts that formed the granulation tissue meet in the center of the wound and develop characteristics similar to smooth muscle. Now called myofibroblasts, these cells—linked to each other by intercellular connections and to the wound edges via their attachments to the granulation tissue—contract and exert centripetal force on the skin edges, drawing them toward the center of the wound (Figure 4). Wound fluid, a derivation of plasma that leaks out of blood vessels due to increased capillary permeability in response to inflammation,3 contains many beneficial factors for healing, including oxygen, nutrients, cytokines, growth factors, chemotactic factors, WBCs, enzymes that aid selective debridement, and systemic antibiotics, if the animal is receiving them.3-6 Wound fluid is serosanguineous in appearance. Exudate, which has a more cloudy appearance, consists of wound fluid plus liquefied necrotic tissue created by WBCs via autolytic debridement and edema caused by inflammation, decreased patient mobility, and inadequate lymphatic or venous drainage.6 Exudate levels are proportionate to the amount of contamination, infection, and tissue damage in a wound, and should subside as the wound transitions from the inflammatory/debridement phase to the repair phase. Persistent exudate is an indication that more aggressive surgical debridement may be needed to remove foreign material, sites of infection, and/or nonviable tissues. Secondary: After granulation tissue formation. Surgical closure should be reserved for wounds that contain only viable tissue, are free of contamination, and can be closed in a tension-free manner. Regardless of timing, surgical closure is preceded by one or more rounds of debridement and lavage, and, except in the case of primary closure, initial management as an open wound. Open wound management includes covering the wound with an appropriate dressing and bandage; it does not mean the wound is left open to the environment. The goal of open wound management is to work synergistically with the cells, providing the best environment possible to support the body’s wound healing process. During the inflammatory/debridement phase, the chosen MRD should support selective autolytic debridement by WBCs and function of cytokines that signal the repair phase, as well as be able to absorb the exudate generated by that debridement. WBCs and their bacteria-fighting proteases function best in a moist environment. Less desiccated tissue, which serves as a medium for bacteria, is present. The occlusive or semi-occlusive nature of MRDs decreases oxygen tension and pH, conditions that attract WBCs, stimulate angiogenesis and collagen formation, and inhibit bacteria. 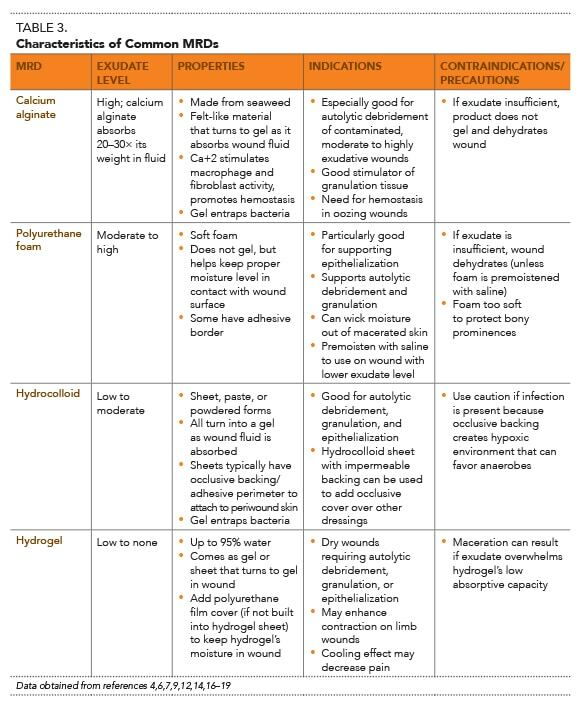 Table 3 summarizes the characteristics and indications for each of these dressings. How much exudate do I expect this wound to produce? What does this wound need (eg, debridement or granulation)? Table 4 provides guidelines for selecting a dressing based on the answers to these 2 questions. 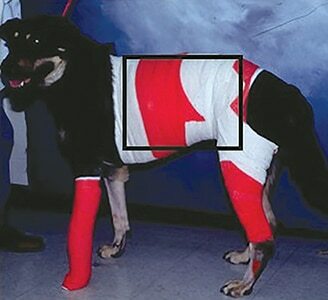 Examples of appropriate dressing selection and application in veterinary patients are provided by Figures 5 to 16. FIGURE 5. 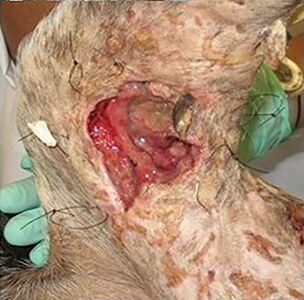 A German shorthaired pointer dog with multiple maggot-infested bite wounds. 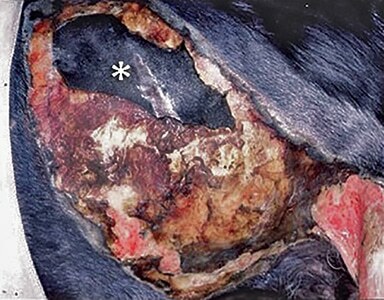 The appearance of this right lateral wound near the stifle was typical of this dog’s wounds. After the dog was anesthetized, wounds were lavaged and debrided of clearly nonviable tissue and maggots. Sutures were placed around the wound to secure a tie-over bandage. FIGURE 6. Patient from Figure 5: Calcium alginate was placed in the wounds to absorb the anticipated high level of exudate and support ongoing autolytic debridement by WBCs. FIGURE 7. 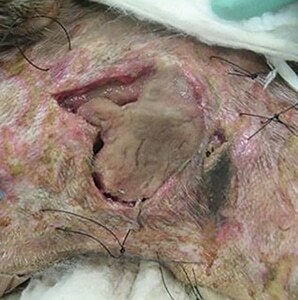 Patient from Figure 5: The calcium alginate dressing and bandage were changed 39 hours later; gelled calcium alginate is seen, contoured to the surface of the wound. FIGURE 8. 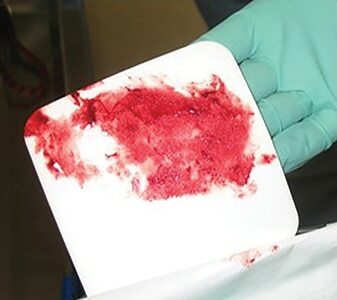 Patient from Figure 5: Removal of the saturated calcium alginate; the slight malodor and purulent-like appearance are characteristic of saturated calcium alginate and do not indicate wound infection. After 7 days of MWH, the wound contained a healthy granulation bed and was surgically closed. FIGURE 9. 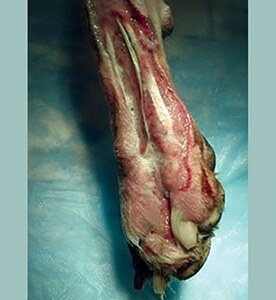 Degloving wound on the distal limb of a small-breed dog: This fresh wound with extensive damage is expected to be highly exudative, making calcium alginate an appropriate choice (A). 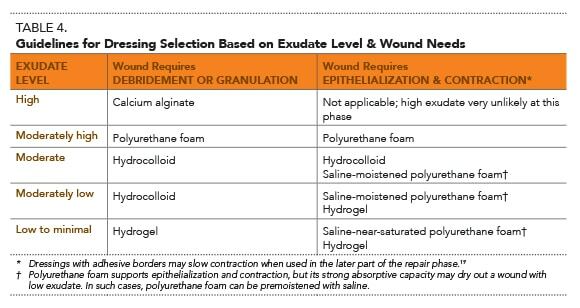 Granulation tissue is forming, but the wound still has a moderately high exudate level; therefore, a polyurethane foam dressing is appropriate (B). FIGURE 10. A 5-year-old border collie was hit by a car and sustained a degloving wound of the distal left hindlimb with exposed bone and tendon. Granulation tissue was forming with the use of MWH techniques. Polyurethane foam was selected due to the expectation of a moderately high exudate level and need for additional granulation and epithelialization. FIGURE 11. Patient from Figure 10: The polyurethane foam dressing was pressed onto the wound to create an imprint, then cut around the imprint so that the dressing would fit in the wound bed and not overlap skin. FIGURE 12. Patient from Figure 10: Six days and 2 bandage changes after the previous images (Figure 10 and 11) were taken, the wound had a healthy granulation bed and epithelialization was underway. A skin graft was then performed. FIGURE 13. 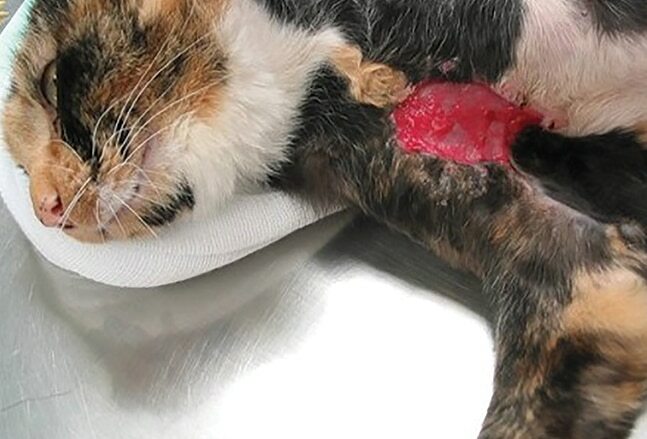 Nonhealing axillary wound—that had dehisced after each of several attempts at closure—in a cat. Prior to this image, the wound had no granulation tissue and a moderately high exudate level; thus, it was bandaged with a polyurethane foam dressing. At the time of this image, the wound required additional granulation tissue and epithelialization. Because the exudate level had decreased to a moderately low level, a polyurethane foam dressing—premoistened with saline before application—was used. The wound healed without requiring surgery. FIGURE 14. 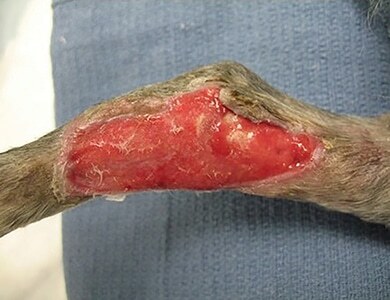 Wound on the medial tarsus of a dog’s limb that is producing a moderate level of exudate; granulation tissue is present but the wound requires epithelialization. Hydrocolloid or saline-moistened polyurethane foam are appropriate dressing choices. FIGURE 15. Degloving wound—that has been lavaged and debrided—on distal limb of border collie dog; residual moisture from the lavage can be seen. Due to the wound’s dry nature, a hydrogel dressing was selected. FIGURE 16. Dry, chronic wound on the tarsus of an 8-year-old Labrador retriever; hydrogel-impregnated gauze was placed after debridement (A). 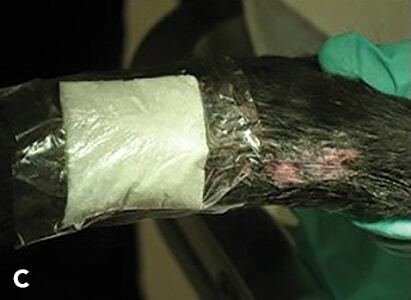 Following placement of a Telfa pad (covidien.com) over the hydrogel gauze, a polyurethane film was placed on top to secure the primary and secondary dressings and help maintain moisture in the wound (B and C). MRDs are typically applied after surgical debridement and lavage. However, in a compromised patient in which anesthesia and surgical debridement are not possible, MWH provides a safe means of getting wound debridement underway until the patient is more stable. To help achieve the right fit, press the dressing on the wound and cut along the resulting imprint (Figure 11). Dressings that absorb and retain a lot of exudate, such as calcium alginate and polyurethane foam, increase in size. Dressings that begin as a gel, or interact with wound fluid to become a gel, conform well to the nooks and crannies of an irregular wound surface (Figures 7 and 8). Some MRDs have adhesive borders designed to adhere to the periwound skin and protect it from moisture (Figure 16). Helps hold the MRD in place. Because the film is waterproof and has no absorptive capability of its own, it prevents wicking of excess exudate into the cast padding. Therefore, it should not be used in situations in which the underlying MRD cannot absorb and retain all of the wound’s exudate. How well the exudate is being addressed by the MRD. The dressing should be changed before it becomes oversaturated or dries out. Lift gel out if coherent (Figure 8), or gently lavage the gel out if not. If the MRD has dried out and is stuck to the wound, inject sterile saline at the dressing/wound interface to release the dressing and avoid a wet-to-dry effect. Left in place too long. In either case, a different dressing should be selected for the replacement bandage. Indeed, the dressing selected at the beginning of wound management is likely to be different from the dressing selected later in wound healing because exudate level and needs of the wound change over time. During the inflammatory phase of healing, when exudate production is highest, a properly chosen MRD is typically changed every 2 to 3 days. As granulation tissue forms, a less absorptive dressing is usually appropriate, and the interval between bandage changes may be increased up to 7 days. A bandage change should always be performed if strike-through or soiling occurs, regardless of the time since the dressing was placed. The use of MRDs and MWH requires some adjustments for clinicians more familiar with dry or wet-to-dry dressings. Many MRDs combine with wound fluid to form a gel, and it is normal for this gel to have a slight odor, yellowish tinge, and slimy feel. While these characteristics can give the impression of infection, they are normal properties of these gels (Figure 8). The wound and patient should always be examined for signs of infection, such as redness, swelling, pain, purulent discharge, and fever. In the absence of such signs, the bandage change can proceed as planned. If infection is present, MWH should still be used to support WBC function, with the dressing choice adjusted, if needed, to handle a higher exudate level. The clinician new to MWH may initially feel uncomfortable waiting multiple days between bandage changes. One way to handle this concern is to, using aseptic technique, unwrap the bandage and look at the dressing in the wound. Upon noting, for example, that a calcium alginate or polyurethane foam dressing is not yet saturated, or that a hydrogel is still moist, the dressing is left in place and bandage replaced. After examining dressings for a few patients, the clinician becomes familiar with the behavior of MRDs and comfortable with the longer intervals between bandage changes. Hosgood G. Open wounds. In Tobias KM, Johnston SA (eds): Veterinary Surgery Small Animal, 1st ed. St. Louis: Elsevier, 2012, pp 1210-1220. Cornell K. Wound healing. In Tobias KM, Johnston SA (eds): Veterinary Surgery Small Animal, 1st ed. St. Louis: Elsevier, 2012, pp 125-134. Rosin E, Ebert S, Uphoff TS, et al. 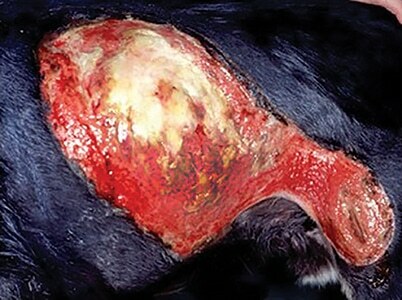 Penetration of antibiotics into the surgical wound in a canine model. Antimicob Agents Chemother 1989; 33(5):700-704. Mayet N, Choonara YE, Kumar P, et al. A comprehensive review of advanced biopolymeric wound healing systems. J Pharm Sci 2014; 103(8):2211-2230. Junker JPE, Kamel RA, Caterson EJ, Eriksson E. Clinical impact upon wound healing and inflammation in moist, wet, and dry environments. Adv Wound Care 2013; 2(7):348-356. Boateng JS, Matthews KH, Stevens HNE, Eccleston GM. Wound healing dressings and drug delivery systems: A review. J Pharm Sci 2008; 97(8):2892-2923. 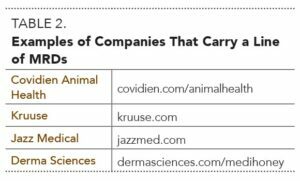 Davidson JR. Current concepts in wound management and wound healing products. Vet Clin North Am Small Anim Pract 2015; 45(3):537-564. Spear M. Wet-to-dry dressings–evaluating the evidence. Plast Surg Nurs 2008; 28(2):92-95. Campbell BG. 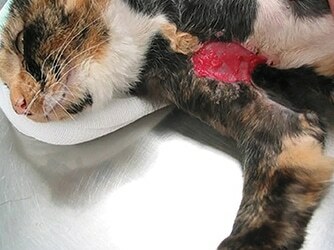 Dressings, bandages, and splints for wound management in dogs and cats. Vet Clin North Am Small Anim Prac 2006; 36(4):759-791. Metzger S. Clinical and financial advantages of moist wound management. Home Healthc Nurse 2004; 22(9):586-590. Lawrence JC. Dressings and wound infection. Am J Surg 1994; 167(1A):21S-24S. Dissemond J, Augustin M, Eming SA, et al. Modern wound care—practical aspects of non-interventional topical treatment of patients with chronic wounds. J Dtsch Dermatol Ges 2014; 12(7):541-553. Hutchinson JJ, McGuckin M. Occlusive dressings: A microbiologic and clinical review. Am J Infect Control 1990; 18(4):257-268. Fonder MA, Lazarus GS, Cowan DA, et al. Treating the chronic wound: A practical approach to the care of nonhealing wounds and wound care dressings. J Am Acad Dermatol 2008; 58(2):185-206. Campbell BG. Bandages and drains. In Tobias KM, Johnston SA (eds): Veterinary Surgery Small Animal, 1st ed. St. Louis: Elsevier, 2012, pp 221-230. Seaman S. Dressing selection in chronic wound management. J Am Podiatr Med Assoc 2002; 92(1):24-33. 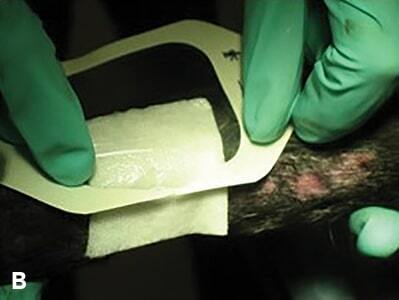 Pudner R. Alginate and hydrofibre dressings in wound management. J Comm Nurs Online 2001; 15(5). Available at: jcn.co.uk/journal/05-2001/wound-management/347-alginate-and-hydrofibre-dressings-in-wound-management/. Segal HC, Hunt BJ, Gilding K. The effects of alginate and non-alginate wound dressings on blood coagulation and platelet activation. J Biomater Appl 1998; 12(3):249-257. Ramsey DT, Pope ER, Wagner-Mann C, et al. 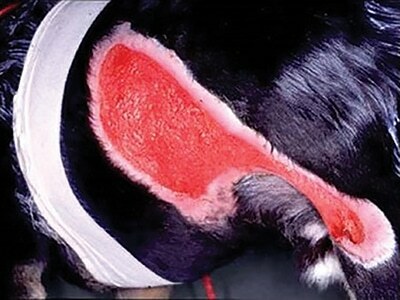 Effects of three occlusive dressing materials on healing of full-thickness skin wounds in dogs. Am J Vet Res 1995; 56(7):941-949. Bonnie Grambow Campbell, DVM, PhD, Diplomate ACVS, is a Clinical Associate Professor of Small Animal Surgery at Washington State University. She speaks at continuing education programs nationally and internationally and has served as President of the Society of Veterinary Soft Tissue Surgery and the Veterinary Wound Management Society. She received her DVM and PhD from Cornell University and completed a small animal surgery residency at University of Wisconsin.